PSD to Html conversion at lightning speed ! These days there are different devices like desktop,iphone,ipads,tablets. All different devices have a different screen sizes & resolution. 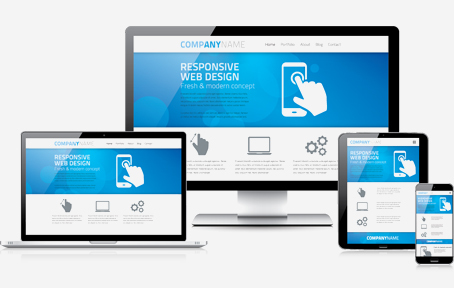 Our responsive websites are well optimized for all these devices for hassle free browser experience. Content will be display properly according to device. High quality service & 24x7 support. All smart phones & tablets compatible. Start your order with Dream soft InfotechUse the form below to give us information about your project and yourself as well. Give your customers hassle free browsing experience! The virtual world of the internet has undergone a drastic change in the last few years. These changes are quite frequent as well. In the present times, there are diverse platforms that are used for accessing websites. Desktops, iPads and mobiles are the devices through which browsing is done. With each passing day, the number of devices being used for web browsing is also increasing each passing day. If you are an online business owner then it is important for you to adapt to new changes so that you can stay ahead in this highly competitive world. Applying new strategies give your users a hassle free browsing experience. If you are looking for PSD to Responsive HTML services then let your search come to an end with us. Since inception, we have been offering solutions that best meet the needs of our clients. We understand the significance of conversion, and thus strive to offer the best to all our customers irrespective of the fact what their needs are. Customers look for nothing less than the best, and we strive to offer the same at pocket friendly rates. High quality code, excellent customer service and precision are synonymous to Dream soft Infotech. Get access to tailor made solutions! Choosing us, you can be assured to get tailor made services that second to none. We strongly believe in rendering solutions that are best for your present business needs. We convert Photoshop designs into W3C validated, cross browser compatible and SEO semantic CSSS/HTML markup. With more than five years of industry experience, we are well versed with the intricacies of rendering high quality solutions to all our customers. We value your time, and thus strive to deliver solutions within the stipulated time. At Dream SoftInfotech, we are backed by a team of highly qualified and experienced professional who have experience and expertise that sets them apart from others. Getting on board with us means that you can get finest of PSD to Responsive Slicing solutions! I am working with these guys & i would recommend Dream soft infotech Great service & quality. Dream soft infotech slicing service is a great for web design agencies who want to outsource there coding work. I am very impressed with quality of work. It was my first project with Dream soft & i decided to outsource all projects for Responsive templates..
Great work at very good price & fast turn around time. Customer support is plus point for these guys. I have no hesitation to recommend Dream soft infotech for psd to wordpress & html responsive projects.